"When I graduated I got the thespian award. 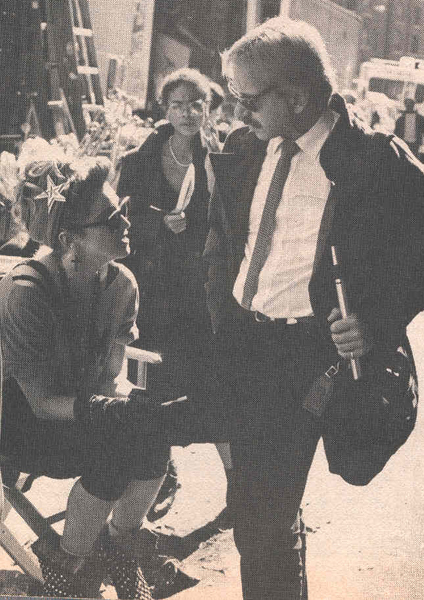 That's my claim to fame"
In the spirit of celebrating our exclusive time capsule interview with Mark Bego, we bring you that special interview he did back in 1984 as Madonna was filming her newest movie, "Desperately Seeking Susan". This is part 1 of a 4 part series of interviews from that day, and in this great segment, Madonna talks about her schooling, her new album and movie, making music videos and that infamous MTV awards performance! Enjoy and keep coming back for more! Mark - Everybody was talking about you on the MTV Awards! Madonna - That and my underpants! (rolls eyes) If I ever see those cameramen, I will personally kill them! They unleashed cameramen on the stage; I had no idea they were going to be there. When I rehearsed, there were two cameramen: one was center stage and one was off on the side. When I did the actual show, there were, like, six all over the place. A camera up my dress! A surprise for everyone! Mark - How is it to work for Nile Rodgers? Madonna - Great! He's wonderful - real smart and a great musician. There are some dance songs on the album, but I have two ballads on it, and it's a lot more pop-oriented. Nile did it, so everything's got that beat to it. I used a lot of live drums on this album, whereas on the first, everything was synthesized on drum machines. 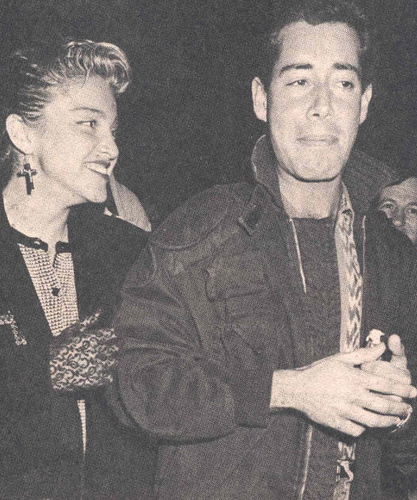 Mark - What about your role in Desperately Seeking Susan? 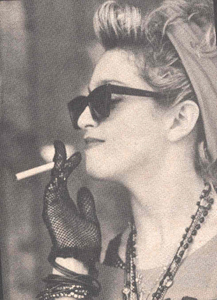 Madonna - Some scripts you read and you can just see yourself in the role. I can see myself in the role of this really free-spirited, adventurous girl that people follow around. This girl causes trouble - she's exciting and unpredictable, irresponsible, vulnerable. We're not exactly alike. She doesn't have any goal, it seems, except to complicate everyone's life - and I did! I want to be somebody, I have goals and directions. Susan doesn't have an occupation or any skills. She just appears and disappears. That gives her a real enigmatic feeling, a sense of fantasy. I think I have more of a definition about myself. Mark - Did you perform a song for the movie? Madonna - I'll be dancing, and the song we'll be dancing to is a song that I've written. I definitely want to write the title track and maybe one other song. They want someone to do background music, but they want one song that's the theme. I've already written it, and I'm waiting for the moment to give it in. Mark - Did you ever answer a personals ad in the newspaper (like the characters in the movie)? Madonna - No! Please - I've read them from curiosity. Mark - How do you interact with Rosanna Arquette in this film? Madonna - We don't actually meet until the end. I find her and she's got all my stuff. She takes over, from about ten minutes into the movie. Everyone thinks she's me because of a jacket of mine she gets from a thrift shop that I've traded for a pair of boots. In it is a key to the locker that holds all my personal worldly belongings. Rosanna gets amnesia after she gets the jacket, so when she wakes up she thinks she's me and goes and gets that stuff and starts dressing like me. She's completely the opposite of me. 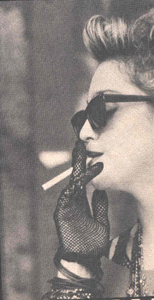 She doesn't smoke cigarettes, but she becomes me. In the end we meet up and we become friends and go away on a vacation together. Rosanna's husband, played by Mark Blum, his name is Gary Glass. I do most of my scenes with him. We connect because he wants to find his wife, and I want to get my stuff back. We become detectives together. Of course, I intimidate him and flirt with him all the time. I move into his house in New Jersey . Mark - What is it like making videos compared to movies? Madonna - The only difference is the movie takes longer, and there's dialogue, but in a lot of videos now, people are talking. A video is like a silent movie. Mark - What about the movie Vision Quest? Madonna - I just sing in it. I sing, I perform in a nightclub that the lead actor and actress come into. They dance a slow dance to a song. I have three songs, but I don't know what they're going to cut out of it. Mark - Have you always written songs? 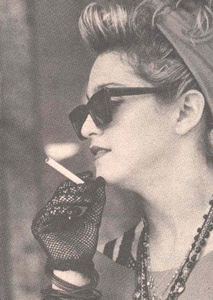 Madonna - I didn't start writing songs till about four or five years ago. Mark - You went to U of M? Madonna - For a semester. I graduated from high school early. I came to New York , I got a scholarship to the Alvin Ailey School , I studied there for a summer. I got a scholarship at U of M and went there for a year and went back to the city and got back into the Ailey school, and that's when I met Pearl Lange and started dancing with her. Mark - What were your earliest ambitions? Madonna - I wanted to be a movie star, but when you grow up in some hick town in Michigan , there's nothing you can do that will make you feel like you're going to be a movie star. I was taking dance, ballet, and jazz classes, and I said, 'I know I can be a dancer.' I was always the lead in every musical and every play in high school. When I graduated I got the thespian award. That's my claim to fame. I was a rebel in school. I didn't really fit in. I hung out with all the misfits and freaks that nobody wanted to hang out with. My father thought it was immodest. He kept telling me how immodest I was. There were talent shows in high school, and I'd perform in them every year, and I'd do one outrageous thing after another. My father would sit and be horrified. One time I put a bikini on and painted my body with fluorescent paint. I painted weird designs all over my body and danced to a Who song with black lights flashing and the lights off. I was in all the plays, and I sang in choir at school. My father, up until about two years ago, was bothering me about going back to the University of Michigan . Mark - So you came to New York and went back to U of M? Madonna - I only went back there because there was a ballet teacher who said he would devote all his attention to me, to prepare me so I could go to New York . They had a dance company there, and I took advantage of the situation. Kind of like training for the Olympics! Mark - If you had a preference between videos, records or movies, which would you choose? 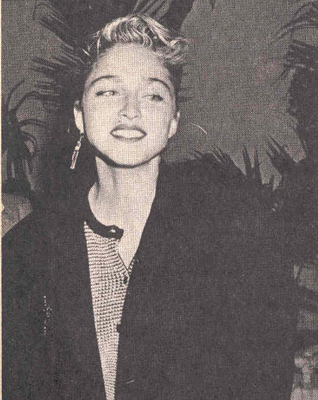 Madonna - All of the above! Right now I'm enjoying making movies more than anything, but I miss singing. On my days off, I go work with this guy that I write songs with. I have a deal with Warner Brothers, I have to make several albums, or else! But I give people songs. I write songs for other artists, for other soundtracks. I wrote a song for Jellybean's album (Sidewalk Talk). There's a French singer named Natalie. RCA gave her a worldwide deal. I wrote her next song that they'll release in America . And I'll write the song for this movie (Desperately Seeking Susan), and another movie Jellybean's producing the soundtrack for (Fast Forward). I like to keep my hands in everything. My video from the new album (Like A Virgin) will be released, and I'll do one for the second single (Material Girl). I have decided on the director: Jean-Paul Goude. He was married to Grace Jones. Mark - Who directed the Like A Virgin video? Madonna - Mary Lambert. She did Borderline. She did Sheila E's video (Glamorous Life), the Go-Go's video (Turn to You). If I didn't have video, I don't think all the kinds in the Midwest would know about me. It takes the place of touring. Everybody sees them everywhere. That really has a lot to do with the success of my album. If I didn't make great songs and didn't make great videos...That's not the only thing that will guarantee your success, but it does allow exploitation. I think that I make consistently good videos. Mark - Will there be a video album? Madonna - Yes, for Christmas. Borderline, Lucky Star, and the new video, Like A Virgin. I just made the deal a couple of weeks ago. Borderline is my favorite video so far and in Lucky Star, none of the dancing was planned - I just did it! Or the black-and-white section in Borderline, and the part in Burning Up when I'm on the road. None of that was planned. I don't have MTV. I do see videos, I go to Private Eyes (a video club on West 21st Street ). I haven't seen any good videos lately. I like Sheila E's video (Glamorous Life). The last video I went crazy over and wanted to see over and over again was Billie Jean (Michael Jackson). The director (Steve Baron) did my first video, Burning Up. Mark - What about a concert tour? 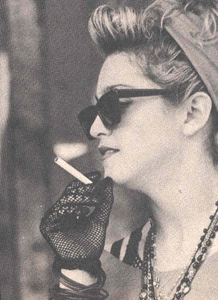 Madonna - I have to admit I'm not really thrilled about it, because I'm making a movie, and my attention's on that. If I go on tour, it means I have to go start auditioning all the musicians, sit for hours and hours and listen to a bunch of awful musicians, and then I have to get them to play all my songs right! And I don't like traveling when I'm working. I like to travel, but not in a van with a bunch of people! Mark - If you did tour, would there be a concept to the show? 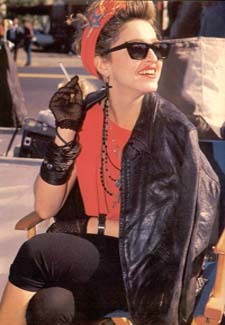 Madonna - Yes, definitely! Up to now, I've sung live to tape and used dancers. I'd combine dancing with it. I will do a tour eventually. I think I'll go to Japan and Australia in the beginning of next year. It's really bad to tour America in the winter. It's the worst: you get stuck everywhere! I'll probably do a major-city American tour in the spring. Mark - Do you have a vision of a stage concept? Madonna - Yes, but I'm not telling anyone. It's a long way off! Thank you, Mark Bego, for this wonderful interview!